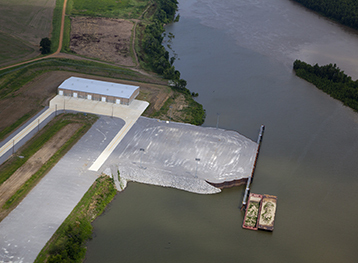 This project, located in northwest Tennessee on the Mississippi River, creates a new multimodal port with a working elevation above the 100 year flood plain. 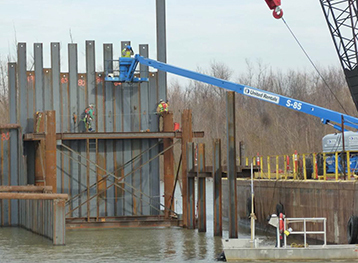 Aquarius Marine teamed with Choctaw Transportation to construct a 15 unit OPEN-CELL® structure and dolphins that have a working dock length of over 600’. 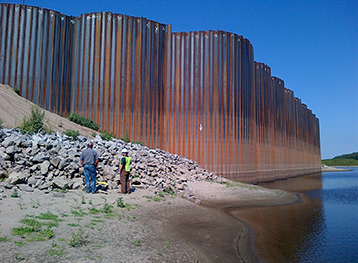 The OPEN-CELL® structure consisted over 900 individual PS31 sheet pile that ranged in length from 55’ to 80’. 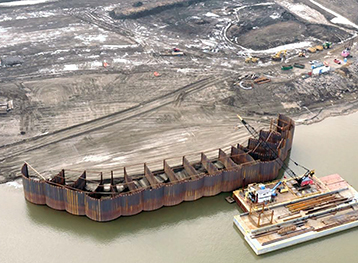 Also included in the work was the installation of 38 each 24” pipe pile, some with patented Spin-Fin tips, to construct various fender piles and dolphins. Aquarius Marine self-performed all pile driving operations, the fabrication and erection of all steel structures, as well as the vibra-compaction of fill.